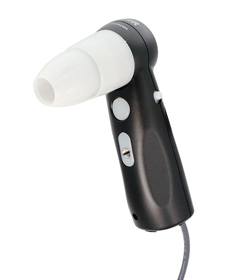 Take this camera microscope in your hand during an examination and touch it directly onto the skin, scalp or hair. Then watch the live color video image on the screen and present it to your client or patient. Just by touching the sample with the internally lit lens tip, you are instantly focusing, illuminating, and magnifying to the screen. Capture still images to display on screen for further evaluation, save to a clients file, or print. The ProScope HR2 is a hand-held digital video USB camera for Windows and Apple iOS computers. Capture high quality images and movies directly to your computer at magnifications from 1x up to 400x (the same lenses are used on the Scope On A Rope™ L2, and ProScope Mobile). The ProScope is known for it picture clarity, sharp colors, and high quality construction. HR2 software for Windows and Apple iOS is included with the ProScope, and captures stills, movies and time-lapse video;,has a thumbnail strip, and full screen mode. The ProScope HR2 works with STR's CompareView and CompareView Hair for added features including client management, side-by-side image comparison, and hair analysis. ProScope Scalp and Hair and Skin Examination Kits - choose one of the Camera and lens kits by clicking "scope kits" here or in the green bar below OR make your own custom camera and lens kit by selecting the ProScope HR2 camera (body only, part# HR2-USB below), and then add lenses and accessories individually.